I have a lot of issues with the pseudo-medicine pushed by many many websites whose sole purpose is to push woo, or nonsense, to their readers. Then they have links to buy junk medicine from their website. Natural News, Mercola, and others have become multimillionaires with this business model. These “entrepreneurs” deceive their readers with pure pseudoscience, using misleading language, and searching scientific literature for research that confirms their beliefs and ignoring everything that refutes it. They oversimplify complex issues, “take this pill, it will prevent all cancers,” making it seem most medicine can be boiled down to taking a couple of supplements–which they sell on their website. Of course. Many of us say that about these woo-websites’ general antivaccination beliefs. This blog has posted numerous articles about the Natural News’ unethical and risky antivaccination articles. Mike Adams, the so-called Health Ranger and wealthy owner of the Natural News, makes his money by pushing his lies and misinformation about vaccines. But Natural News isn’t the only guilty one. GreenMedInfo, run by one of America’s great pseudoscience-pushing lunatics, Sayer Ji, is more or less equivalent to Natural News on the woo-meter. Ji apparently uses the official manual for making money on pseudoscience, which caused him to write articles that sound really science-y. But when you dig down below the surface, Ji is pushing the same old disinformation that all other woo-websites do. I have examined Sayer Ji’s pseudoscience before. Ji hates the hep B vaccine. Ji hates the HPV vaccine. Ji thinks that GMO foods cause cancer. There are many more articles in this blog, and the only conclusion I can make is that he has not made one objectively truthful statement ever about medicine. Ji is the King of Cherry-Picking Lunatics. Sayer Ji has no background in medicine or science. He does not have an undergraduate or graduate degree in any field of science or medicine. He has never done real research in a real clinical or scientific laboratory, and never publishing results in high level journals. He has made of life of pushing pseudoscience in foods, vaccines, agriculture and other areas. He is backed by one of the biggest pseudoscience pushers on the planet, Joe Mercola. In other words, Sayer Ji is just like Mike Adams–pretends to know a lot, but in fact, has no qualifications, experience, or general knowledge to support claims. But they both certainly have slobbering minions who support them and buy their junk. But, it gets worse. One of his “medical advisors” (and frequent co-writer of articles) is a real physician, Kelly Brogan, who has lost her way from science based medicine and become an antivaccine cultist. Dr. Brogan has no background in real biomedical research (not a requirement to be a real physician, but a necessity if you’re going to pontificate about important areas of medicine). So this is the gang that supports Ji. A woo-pushing Mercola. A pseudoscience-pushing Brogan. How can one take anything that Sayer Ji writes as serious? Before we refute Sayer Ji’s pseudoscience, but I think it’s important to have a good background in the area of insulin and diabetes. I’m condensing years of knowledge into a few paragraphs, so enjoy. The basic power source of our body is glucose (think of it as fuel), one of the basic sugars that is metabolized by human cells to help run all of the processes in the cell. Glucose comes from one of three sources: foods, where sugars and complex carbohydrates are broken down in the digestive tract into four simple sugars (one of which is glucose); the body’s internal manufacturing of glucose from proteins, fats, and other sources to help provide energy to cells; and from glucose stored in cells, primarily the liver. Glucose levels in the blood are usually tightly regulated by the body, so that when blood glucose is high, it is taken out of the blood and stored–but when the blood glucose drops, it is then released from storage to be used for energy. Most healthy individuals don’t notice all of this regulation because it’s automatic and requires nothing to make it work perfectly. This system is quite complex. The key hormone, insulin, which regulates the level of glucose in the body, is released by the Beta cells of the Islets of Langerhans in the pancreas when blood sugar goes up–insulin then induces storage cells to remove and store glucose from the blood. In a complex interaction, the hormone glucagon, produced by other cells in the pancreas when the blood glucose level is too low, which then induces release of that stored glucose. (This once again goes to show how complex living systems are, and simple explanations are laughable and should be dismissed.) It’s a fascinating system of the body, and it’s remarkable that it works so well in 99% of people. I have simplified the description of this blood sugar regulation system, because a full explanation of all of the interacting proteins, cells, and organs would take 100 thousand words. People like Sayer Ji, who lack the knowledge of how blood sugar regulation really works, do harm by making broad claims like the junk supplements that he sells has some benefit, when they don’t. He makes these claims because he simply knows nothing of endocrinology of blood sugar. That would actually take intellect and hard work, something that science deniers like himself wouldn’t understand. It’s all about making money, not helping fellow humans–oh wait, that’s his claims about Big Pharma. Unfortunately, when the body is incapable of regulating the level of glucose in the blood, a disease results called diabetes. Usually, in diabetes, either the body stops making insulin or cells become resistant to insulin, in both cases, blocking the signal to remove glucose from the blood. And this is where disaster happens. Excess glucose leads to serious chronic diseases–including poor circulation to the extremities, cardiovascular disease, kidney failure, limb loss, blindness, and many others. Diabetes, in all forms, can lead to lower lifespan, and a general reduction in the standard of life for an individual. There are four types of diabetes: Type 1, Type 2, gestational, and Latent autoimmune diabetes of adults. Type 1 diabetes mellitus is the result of an autoimmune disease where the body’s own antibodies attack the Islets of Langerhans, causing the production of insulin to drop or even to be halted. As of today, there are no cures or prevention, and the only way to treat someone is to regularly inject human insulin. Vaccine deniers have tried to blame diabetes on vaccines–already debunked. There is another closely related form of Type 1 diabetes, called latent autoimmune diabetes of adults (sometimes called LADA or Type 1.5 diabetes). The symptoms of Type 1 diabetes mostly occur in children, but for those with LADA, the disease doesn’t manifest itself until early adulthood, typically 30’s and early 40’s. There is no practical difference between LADA and Type 1 diabetes, other than age of onset, and the cause is the same–a destructive autoimmune disease. Just as with Type 1 diabetes, the only treatment for LADA is regular insulin injections to control blood glucose. Additionally, for those who are interested, there is a diagnostic test, for C-peptide, which can indicate whether someone has LADA or Type 2 diabetes, because they require different treatments. This leads to the third form of diabetes called Type 2, which is probably caused by a combination of genetics, obesity, eating behavior, and several other factors. Usually, the pancreas produces sufficient insulin, but the body’s cells and organs become “resistant” to the insulin, meaning that they ignore the signal to store glucose, and thus the blood glucose remains high. Oral medications, behavioral changes, such as improved diet and exercise, can often help manage if not reverse Type 2 diabetes–in other words, Type 2 diabetes is curable, as opposed to Type 1. Just in case you’re wondering, “natural supplements” probably won’t help at all. Finally, the fourth type of diabetes is gestational. This disease results from a complex interaction between pregnancy hormones and insulin, which in some women cause the blood glucose level to rise to dangerous levels. The disease is caused by a number of factors (some not well understood) including age and weight of mother, size of fetus, family history of diabetes and other issues. Gestational diabetes is dangerous to both the mother and fetus, and close monitoring and control of blood glucose is important. The disease was once thought to be temporary, but there is evidence that there is a significant risk for a mother with gestational diabetes to develop Type 2 diabetes. Diabetic ketoacidosis occurs in individuals whose blood glucose becomes dangerously high over a short period of time, is a painful, life threatening condition that will kill the patient unless the blood glucose level is quickly brought down. Diabetes is a dangerous acute and chronic disease that leads to many other chronic issues that are also life-threatening. Insulin exists in almost every animal on earth–insects, birds, lizards, mammals and humans. Controlling blood glucose is critical to all animals because it helps regulate the the energy supplies from periods where food is consumed until the period when food is once again available. Thus, animals, like us, don’t have to eat constantly. We can have a meal, wait a few hours, and eat another one without all of our cells dying from lack of energy sources. Before the wide availability of insulin in the 1920’s children simply died of the disease when they were quite young. Nothing could be done. There used to be wards in hospitals where 50-100 children lay comatose at any one time, with families nearby waiting for them to die. It must have been a horrible place, as there was nothing that could be done to save them. Most of the insulin was purified from pig blood, because it was the form of insulin most available and closest to human form. Unfortunately, a small percentage of people were allergic to the pig form, and it still did not work as well as the human form of insulin. By the 1980’s, with the advent of genetic engineering, a division of Eli Lily, Genentech, invented a method to insert the human insulin gene into E. coli, which allowed for inexpensive mass production of human insulin, improving outcomes for diabetics, while almost eliminating side effects like anaphylactic shock. Ironically, the human insulin gene has been inserted in GM safflower, to be used as another method of mass-producing human insulin even more cheaply. 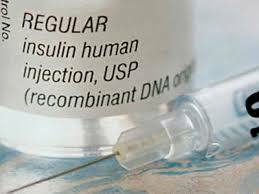 The availability of human insulin has allowed researchers to develop slight variations on the insulin protein with dramatic benefits for human health. In a non-diabetic, insulin is constantly being released to maintain tight control of blood glucose. Unfortunately, a diabetic can’t be injecting themselves every few minutes to keep control. So, researchers developed fast-, short-, medium- and slow-acting versions of insulin, usually by adding one or two amino acids to the insulin molecule. These changes don’t effect the glucose control characteristic of the molecule. A fast acting or short acting insulin (which is just regular human insulin) acts like human insulin released during and immediately after a meal. It causes the blood glucose to quickly drop. However, if too much is injected, the blood glucose could drop rapidly causing hypoglycemia, low blood sugar, which is a serious condition. But as you may surmise, blood glucose doesn’t rise only during the 15 minutes after a meal. As food is slowly digested, and complex proteins, fats and carbohydrates are broken down by the digestive system, there’s a slow release of glucose into the blood from the intestine. The body would continue to release insulin during this period, but in the diabetic, it doesn’t happen, and blood glucose levels skyrocket. One could continue to inject fast acting insulin during this time, but it’s difficult and dangerous. So researchers developed a long acting (and medium acting) insulin that can be injected, but circulates in the blood for hours. Thus, it helps manage blood glucose levels over a long time (especially during sleep, when the body releases glucose into the blood). The differences between these various forms of insulin and simple human insulin is small, usually 1-2 amino acids (the building blocks of all proteins, including insulin). According to Eli Lily, “Insulin glargine differs from human insulin in that the amino acid asparagine at position A21 is replaced by glycine and two arginines are added to the C-terminus of the B-chain.” Now that all sounds scary and chemical, but to me, a trained biochemist, that’s brilliant information. Make slight changes in the protein to get altered effects, without causing an effect to the primary function of insulin, induce lowering of blood glucose. Let’s be clear here, because I’m sure there’s someone who’s going to claim that that one change in amino acid will cause a human to grow horns or something ridiculous–insulin is a chain of 42 amino acids, and the addition of one does not fundamentally change it’s physiological characteristics. Yes, you might be able to change one amino acid somewhere and change the characteristics, but then it wouldn’t work. That’s what science is about, proposing a change, testing it, analyzing the results, and then moving forward or modifying it again. 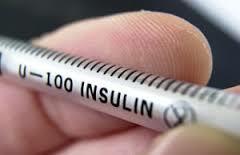 Long and short acting insulin are lifesavers for diabetics. They allow the patient to better control their blood glucose over a day, reducing short-term blood glucose fluctuations while improve long-term outcomes. Children who get diagnosed with Type 1 diabetes today will have better chances to live a full, productive life because of modern insulin. Here we go again. Sayer Ji wrote an article recently in GreenMedInfo entitled, Research: Insulin Can Kill Diabetics; Natural Substances Heal Them. A paradigm-shifting study indicates that the standard of care for diabetics, including synthetic insulin and oral anti-diabetic drugs, increases morbidity and mortality from diabetes. Natural substances, on the other hand, have proven healing properties that if used, could mitigate the global diabetes epidemic. Synthetic insulin is the pride and joy of the biotech industry, being the first successful product produced through recombinant DNA technology; a technology which would eventually take the world by storm through its use in developing most of the GM crops in our present-day Biotech/Big Chem owned agricultural model, and is now the basis for billions of dollars of products in the food, medical and chemical industries, with an untold vastitude of mostly unexplored health risks. Before I mock the stupidity of what was written here, let me be perfectly clear about something–the pig derived versions of insulin not only did not work as well as modern insulin, but there was a small but serious risk of serious allergic reactions. One cannot find a single endocrinologist (you know, real medical practitioners who have real knowledge of diabetes, as opposed to Sayer Ji, who knows nothing about science and medicine) who would stand up and say, “let’s move from human insulin to pig insulin.” There is only 1 amino acid difference between human and pig insulin, but in the case of “nature”, that difference is significant to the human body, as opposed to the genetically manufactured ones, which are exactly like human insulins. How diabetes, not insulin, causes cancer. The real plausible pathway. Mr. Cherry-Picker Ji fell in love with a couple of recent articles, and from the information he derived from those two articles, while ignoring all other data, loudly proclaims that insulin can kill. The first one, from Holden et al, published in November 2014, attempted to show a correlation between mortality, cancer and other conditions with Type 2 diabetics who began insulin therapy (about half of type 2 diabetics begin insulin therapy after other medications and lifestyle changes fail). The research found that there was a small increase in rate of all cancers and death in the group that used insulin. The second study that was cherry-picked was, from Currie et al., showed similar results in a larger study. Confounding data, like trying to determine if type 2 diabetics who use insulin are in fact more at risk of morbidity and mortality as a result of their underlying disease rather than using insulin. Usually, only type 2 diabetics with the most serious forms of the disease are prescribed insulin. Both studies completely ignore this point–Sayer Ji, and the authors of these articles, seem to ignore that the insulin using group is more at risk of death anyways! In effect, these studies have a control group which is vastly different than the treatment group, so valid conclusions just can’t be made. Insulin causes cancer? Which cancer? There are 250 different cancers, and each has a different cause and developmental pathway, and how is it even plausible to assume that engineered insulins have any causal pathway to cancers. 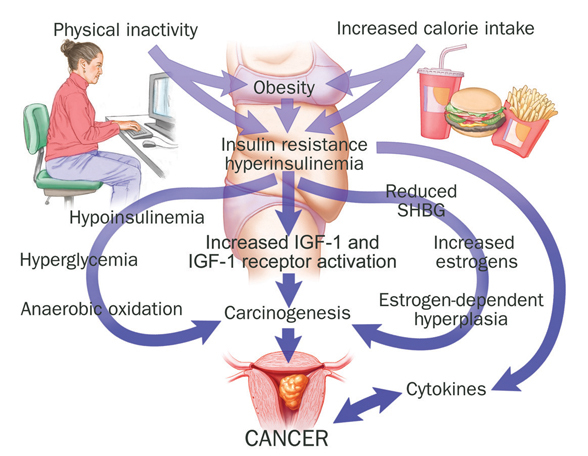 In fact, obesity, a general cause of Type 2 diabetes is also linked to all kinds of cancer. These studies aren’t wrong about cancer, but they completely ignore the underlying causality, that is, general bad health. Oral diabetes medications have their own risks. Some only control blood glucose for a short period of time. Some actually work best in maintaining blood sugar in conjunction with insulin. There is no plausible mechanism that would convince me that a small alteration to a biological protein could have any effect. Just about any animal based food we eat would have a form of insulin protein in it, and why would those not cause cancers? And if one understands the process of how cancer develops, where could a regular protein induce this cancer? Almost all cancers require several mutations–how can a protein, like insulin, induce a mutation? It attaches to insulin receptors on the cell, is broken down, and the amino acids are used to make other proteins. And all of the amino acids are exactly alike, no matter the source. So, by what logical process would an engineered protein, with additional amino acids, have any effect that would lead to cancer? It simply doesn’t, unless there’s something that will throw cancer research into a whole new world. I guess Sayer Ji is working on his Nobel Prize speech spouting off about this new area of cancer research. But like I said, Sayer Ji is cherry picking data, and bad data at that. Let’s be positive and look at some of the best recent research. In a systematic review of 11 studies including nearly 450 thousand patients, along with 19,000 with cancer, the authors found that “results from the meta-analysis don’t support the link between insulin glargine and an increased risk of cancer and the confidence in the estimates of the effects is very low.” That’s a massive study that found that the confounding factors are crucial to isolating the diseases effects on the rate of cancer from the insulin’s effect. A well controlled study of cancer patients showed a reduced risk of prostate cancer in those who use human insulin. And no change in risk of breast cancer. A systematic review of 16 studies, they found no change in risk of cancer to patients who use regular insulin (also called NPH) and different forms of insulin. In a study of over 36000 diabetic patients, the researchers found that, “overall, insulin glargine use was not associated with an increased risk of all cancers or site-specific cancers in Scotland over a 4 year time frame.” The researchers also stated that research that showed a correlation may result from built-in biases from the selection of populations. Again, the insulin group appears to have more serious risks that have nothing to do with taking insulin but because their medical issues, which have an increased risk of mortality and cancer, require insulin. I’m not going to even get into Sayer Ji’s “natural” cures for diabetes. There is no scientific evidence that they work. And it would kill type 1 diabetics. Type 1 diabetes cannot be cured…yet. I think that some Type 1 diabetics can have their diseases reversed, if treated early, but the research is still early, and no clinical trials have been published to tell us if it works. Type 2 diabetes definitely can be cured. But not by eating some herbs. Wholesale lifestyle changes, including weight loss and more exercise (which go together I suppose) and a better diet (from a science point of view, meaning control of portions and contents), can reverse Type 2 diabetes. That’s hard work, but I’m just saying that’s the way to do it. Bioengineered human insulin is a lifesaver, and no good evidence supports the hypothesis that it might cause cancer. The underlying health of the patient might increase the risk of cancer. Not insulin. Sayer Ji is either badly misinformed, woefully ignorant, or simply a liar about real medicine to drive clicks to his “natural” products sales to make more money. But to promote an idea that might kill thousands and millions of people is unconscionable–then again, charlatans like Sayer Ji could care less about conscience. I hope that people who run across his lies, also find my website. I hope that pediatricians everywhere aren’t going to be hit with requests from parents to find a better “natural” insulin so their children don’t get cancer. I’d never become a pediatrician, because I’d be screaming at idiotic parents, but if I were, I’d say “sure, we don’t need to use real insulin from Big Pharma. But you better make a reservation at the funeral home.” Then I’d call the police anyways. I’m glad that nicer people become kind, diplomatic pediatricians. Note: special thanks to Dorit Reiss for pointing out this article to me. It had to be refuted. Colhoun HM; SDRN Epidemiology Group. Use of insulin glargine and cancer incidence in Scotland: a study from the Scottish Diabetes Research Network Epidemiology Group. Diabetologia. 2009 Sep;52(9):1755-65. doi: 10.1007/s00125-009-1453-1. Epub 2009 Jul 15. PubMed PMID: 19603149; PubMed Central PMCID: PMC2723678. Currie CJ, Poole CD, Evans M, Peters JR, Morgan CL. Mortality and other important diabetes-related outcomes with insulin vs other antihyperglycemic therapies in type 2 diabetes. J Clin Endocrinol Metab. 2013 Feb;98(2):668-77. doi: 10.1210/jc.2012-3042. Epub 2013 Jan 31. PubMed PMID: 23372169; PubMed Central PMCID: PMC3612791. Dejgaard A, Lynggaard H, Råstam J, Krogsgaard Thomsen M. No evidence of increased risk of malignancies in patients with diabetes treated with insulin detemir: a meta-analysis. Diabetologia. 2009 Dec;52(12):2507-12. doi: 10.1007/s00125-009-1568-4. Epub 2009 Oct 17. PubMed PMID: 19838665. Holden SE, Jenkins-Jones S, Morgan CL, Schernthaner G, Currie CJ. Glucose-lowering with exogenous insulin monotherapy in type 2 diabetes: dose association with all-cause mortality, cardiovascular events, and incident cancer. Diabetes Obes Metab. 2014 Nov 14. doi: 10.1111/dom.12412. [Epub ahead of print] PubMed PMID: 25399739. Lind M, Fahlén M, Eliasson B, Odén A. The relationship between the exposure time of insulin glargine and risk of breast and prostate cancer: an observational study of the time-dependent effects of antidiabetic treatments in patients with diabetes. Prim Care Diabetes. 2012 Apr;6(1):53-9. doi: 10.1016/j.pcd.2011.10.004. Epub 2011 Nov 4. PubMed PMID: 22056422. Rodgers L, Conrey EJ, Wapner A, Ko JY, Dietz PM, Oza-Frank R. Ohio primary health care providers’ practices and attitudes regarding screening women with prior gestational diabetes for type 2 diabetes mellitus – 2010. Prev Chronic Dis. 2014 Dec 4;11:E213. doi: 10.5888/pcd11.140308. PubMed PMID: 25474385. Tang X, Yang L, He Z, Liu J. Insulin glargine and cancer risk in patients with diabetes: a meta-analysis. PLoS One. 2012;7(12):e51814. doi: 10.1371/journal.pone.0051814. Epub 2012 Dec 19. PubMed PMID: 23284776; PubMed Central PMCID: PMC3526637.